Glade Coupon is found on Websaver.ca’s website. Select the coupon, create an account, and then claim your coupons. This will help yoi save money on groceries. There are two Glade refill coupons available. They are both printed coupons which you can print directly from your conputer. 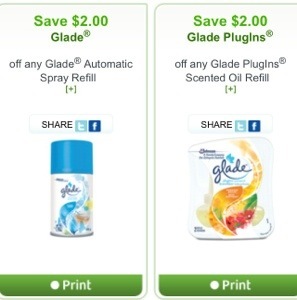 One coupon is to save $2 on Glade Automatic Spray refills and the other is to save $2 on Glade plugin scented oil refills. 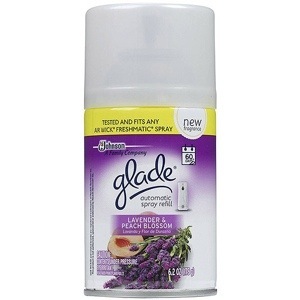 You can find Glade refills in any supermarket. You can also use printed coupons in any supermarket and grocery store. I’ve used printed coupons at Shoppers drug mart, Loblaws, amd Walmart with no problems. Couldn’t we all use one less thing to worry about? The Glade® Automatic Spray is a battery-operated unit that time-releases fragrance automatically, while a boost button provides more control with an instant burst of fragrance – and when it comes to certain rooms in our home, that’s called peace of mind.